Community Blog by coffeewithgames // ExciteBots: Trick Racing! Official U.S. Nintendo Channel data report. ExciteBots: Trick Racing! Official U.S. Nintendo Channel data report. Can you imagine a video game sales pitch to a publisher which mentions, "Sandwiches: Drive through the ingredients in the proper order to make a delicious sandwich. ", as a mini-game feature? Probably not? Yeah, I couldn't either until I saw it in motion and did just that in ExciteBots: Trick Racing on the Wii! ExciteBots: Trick Racing released for the Wii in the U.S. on April 20, 2009, with two SKUs available for purchase. One SKU included the game with the Wii Wheel peripheral, the other SKU was just the game only. ExciteBots was developed by Monster Games, the same developer behind the Wii launch title Excite Truck and the 3DS launch title PilotWings Resort. The game was published by Nintendo, and received an ESRB rating of "EVERYONE" with "Mild Fantasy Violence" listed as content for parents and gamers to be aware of. How many hours have U.S. Wii owners spent making sandwiches, playing darts, bowling, and throwing pies at clowns during races in ExciteBots: Trick Racing, since the game released just over 4 years ago? 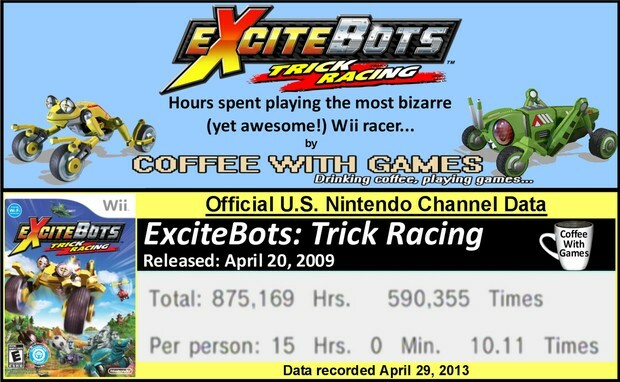 If you own a Wii, or even a Wii U, how many hours might you expect from ExciteBots: Trick Racing should you buy it? Brew yourself some coffee, and let's take a look! 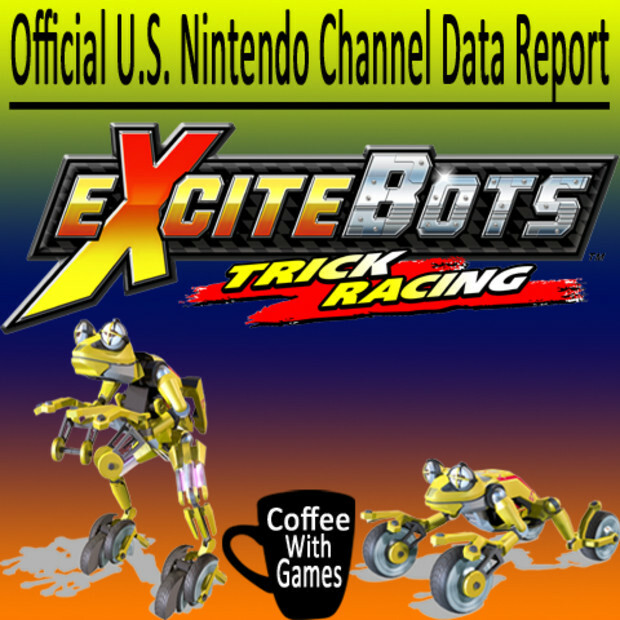 ExciteBots: Trick Racing has approximately 58,393 U.S. Wii owners with game-play data reported through the Nintendo Channel. The game's 875,169 Total Hours of reported game-play (seen in the image above), is equivalent to the game being played for almost 100 straight years! The game's reported average of 15 Hours 0 Minutes "Per person", makes ExciteBots: Trick Racing the Wii's most played game in the Excite series on the system. That's more hours played "Per person" than Excite Truck, the Wii NES Virtual Console Excitebike release, and the WiiWare Excitebike: World Rally release. U.S. Wii owners have averaged playing the game about 1 Hour 29 Minutes each time they play it, according to the data from the image. How was ExciteBots received by critics and customers? The game currently has a "professional" review score average of 80.19%, based on 27 reviews from GameRankings.com. The current customer review score average is 87.77%, based on 54 reviews for both SKUs of the the game on Amazon.com. Overall, positive reviews from critics and customers that have played the game. Destructoid's very own Jonathan Holmes reviewed the game in May 2009, and his score was slightly lower than the critic and customer review score averages above. He gave it a 7.5 out of 10, and you can read his full review of the game, HERE. First, let me answer the second question (okay, really like fourth question) from above. If you own a Wii, or even a Wii U, is ExciteBots: Trick Racing a game you should look at buying? YES! If you enjoy arcade racing type games that have a great sense of speed, I highly recommend you give ExciteBots a try. The game can now be found for under $20 new, and under $10 used. (Only $5 used HERE, at GameStop!) Now, if you're a Wii U owner interested in the game, you just need to make sure that you own a Wii Remote as well, because Wii games can't currently be played with the Wii U GamePad. As for my reported game-play time with ExciteBots, the image above shows what my reported time with the game is, as it appears on the Nintendo Channel. So, I have just over three times the number of hours played, as the reported average "Per person". Again, if you can grab the game now for under $10 used (I doubt Nintendo is still publishing it), I would highly recommend that you do so. You should easily be able to get around 10 hours of game-play from it just enjoying the single-player racing campaign on your own, without even playing local or online multiplayer or the mini-games in it. Like I mentioned in a piece over 2 years ago, ExciteBots: Trick Racing had little (to no) advertising before and after it released, which I find unfortunate and it might be a reason you have never heard of the game (or, simply forgot about it quickly). If you haven't seen any footage from the game, the video below should give you a good idea of how the races are set up. Monster Games (again, the developer) has a pretty solid record of racing games now, and in just a few shorts weeks their next game will be released for the Nintendo 3DS, Donkey Kong Country Returns 3D. I'm glad to see Nintendo has apparently formed a good developer/publisher relationship with Monster Games, allowing the developer to even try new things outside of their racing roots with series like PilotWings Resort and now porting Donkey Kong Country Returns 3D. Seeing that Monster Games has produced some really solid games for Nintendo platforms in recent years, like ExciteBots, I really hope that Nintendo will let the developer create either a new Excite game for the Wii U. If not a new Excite game for the Wii U, I think even a completely new racing game from Nintendo's F-Zero or Wave Race series for the Wii U (personally, I would like a Wave Race HD title right now) would be great. If you perhaps played both Excite Truck and ExciteBots: Trick Racing on the Wii, which game did you enjoy more? If you enjoyed ExciteBots as much as I did (or, perhaps even more and paused playing it to leave a comment! ), do you hope that Nintendo will get Monster Games to make an ExciteBots sequel for the Wii U? Also, if you have played a lot of racing games on the Wii, can you think of one that is perhaps more hilariously bizarre and fun to play than ExciteBots?